Every summer I seem to gravitate to a new salad recipe. 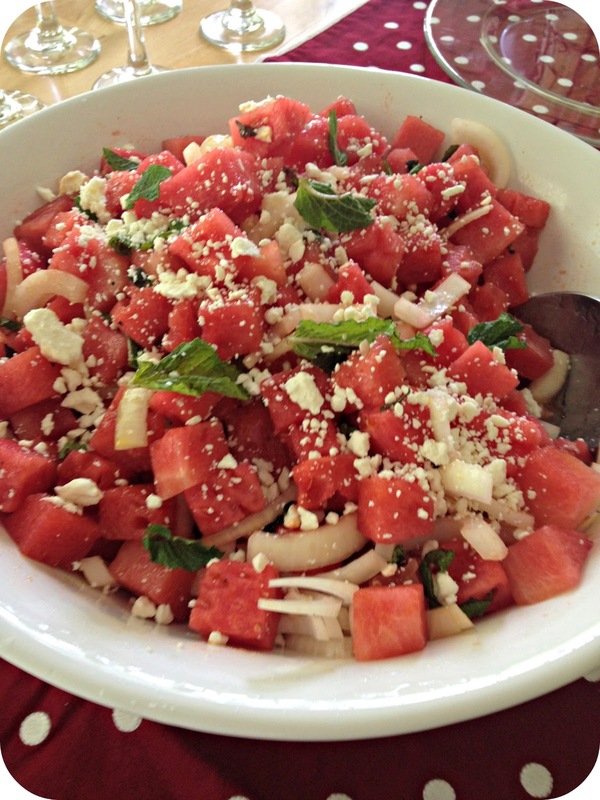 Last year it was this Simple Summer Salad and this year it's this incredible Watermelon and Mint Salad. We had some of my hubbies coworkers over this weekend for a summer BBQ and this was one of my contributions to the feast. The recipe was adapted from Paula Dean's recipe. Cut the flesh from the melon and cut it into bite size pieces, set aside. Peel and slice the onion into rings. This is where I deviated slightly from the original recipe noted above. 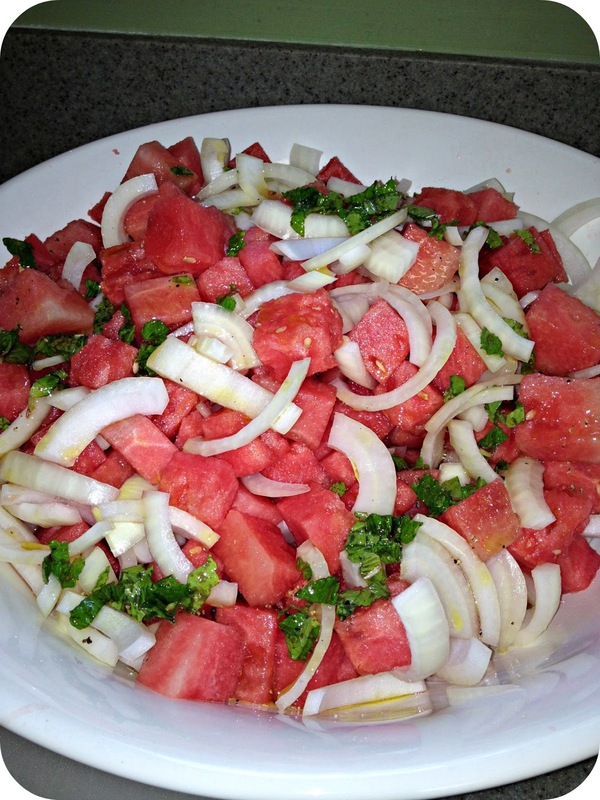 Originally I cut the onions into rings but they were far too large in comparison to the watermelon bites. So I later went back and quartered the rings. I recommend cutting the onion into small bite-size pieces so that it's similar to the watermelon. 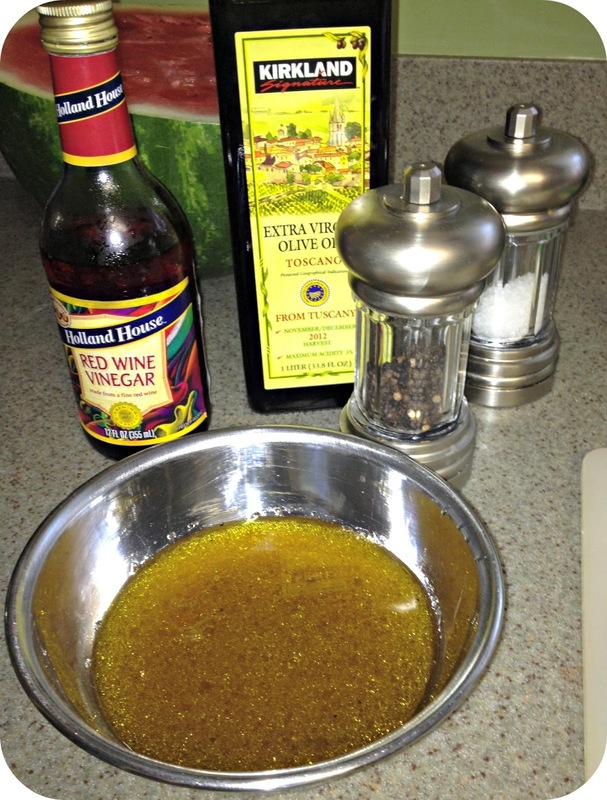 In a small bowl, combine the vinegar, salt, pepper, and whisk until salt is dissolved. Slowly whisk in the olive oil, a few drops at a time. Add the chopped mint, taste, and adjust seasonings. In a large bowl, combine the melon and onion. 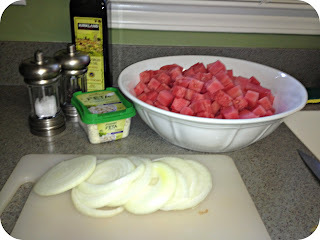 Pour the dressing over the melon mixture and toss gently until everything is coated and evenly mixed. 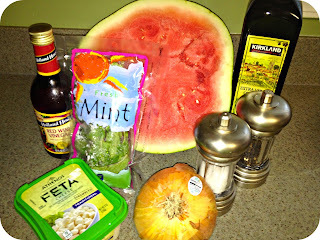 Right before serving I added the feta cheese and mint sprigs. I have to admit this recipe sounded off the wall when I first heard all the ingredients but they combine into a salad of heavenliness. In addition to cutting the onion into smaller pieces, I also added more mint to my version. When I followed the original recipe I wasn't able to taste it.